Michael Phelps could be in hot water -- not the cold bathtub he appears to be in -- for his recent photo shoot with the French luxury fashion house Louis Vuitton. Photos of Phelps taken by famed photographer Annie Leibovitz were leaked on the Internet late last week, violating the International Olympic Committee's controversial Rule 40, which states athletes can't promote any non-Olympic sponsors from July 18 to Aug. 15. Punishments for the rule range from fines to a stripping of medals. The campaign was set to begin on Aug. 16 in order to comply with the IOC's campaign against ambush marketing. Someone jumped the gun and the photos appeared on a wide variety of websites starting on the second Tuesday of the Olympics. 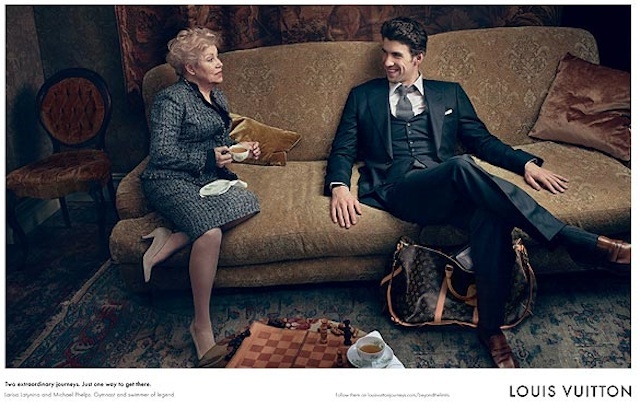 Louis Vuitton denies releasing the photographs, as does Phelps' camp. Rule 40 states "a competitor or a team may lose the benefit of any ranking obtained in relation to other events at the Olympic Games at which he or it was disqualified or excluded; in such case the medals and diplomas won by him or it shall be returned to the IOC." In other words, Phelps could theoretically be stripped of his medals from London. The odds of the that happening are about the same as the swimmer winning six gold medals in women's gymnastics at the Rio 2016 Games. Unless there's a vast conspiracy involving the maker of high-end trunks and the world's greatest swimmer, it seems safe to assume that these photos were leaked by a rogue individual. Pictures that aren't meant for public consumption get leaked all the time. Michael Phelps can attest to that fact. Then again, one of the leaked ad photos was with former Russian gymnast Larisa Latynina, the woman whose record for most Olympic medals Phelps broke in London. If we were still in Cold War mode, it'd be a legitimate possibility that she leaked them as part of a wide-ranging conspiracy to get back her record.